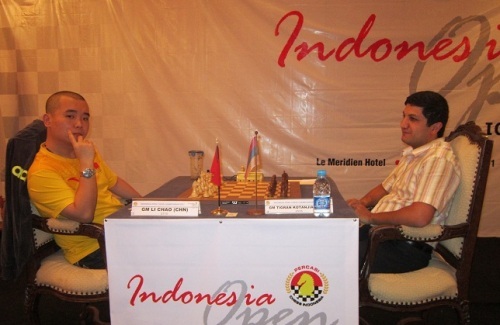 The 2011 Indonesia Open Chess Championship was held from 13th to 19th October at the Le Meredien Hotel in Jakarta. 80 players competed in the 9-round Swiss tournament. The generous prize fund amounts to 55.500 USD, with 10.000 USD reserved for the winner. Top seeded Wang Yue and former Asia champion and Anand’s second Ganguly Surya Shekhar played a draw on the first board, while 3rd seed and Universiade champion Li Chao b defeated Sandro Mareco and joined Ganguly on the shared first place. Li Chao b takes the winner’s trophy on better tie-break score. In the other games Oliver Barbosa held the famous Alexey Dreev to a draw with black pieces. In the Philippines’ derby Wesley So beat GM-elect Richard Bitoon to secure a shared 3rd place. Full standings bellow. Photos by Reza Mahdipour.